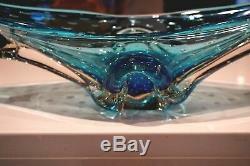 A beautiful vintage murano glass centerpiece Bowl. It measures 14 cm high and 44.5 cm long by 13.5 cm wide. 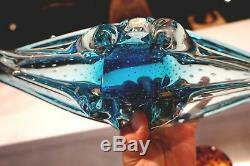 The item "Beautiful Vintage Murano Glass Centerpiece" is in sale since Saturday, October 14, 2017. This item is in the category "Pottery, Glass\Glass\1950 - 1979".